BALCATTA, AUSTRALIA--(Marketwire - May 12, 2008) - Aurora Gold Corporation (the "Company," "Aurora Gold") (OTCBB: ARXG) (FRANKFURT: A4G) (XETRA: A4G) (BERLIN: A4G), a mineral exploration company focusing on exploration and development of its properties in the Tapajos Gold Province, State of Pará, Brazil, is pleased to announce that the Company has entered into a Corporate transaction with Samba Minerals Limited ("Samba"), an Australian Public Company intending to list on the Australian Stock Exchange. The Company has signed an agreement with Samba, whereby Aurora Gold has agreed to allow Samba to earn up to a 75% interest of the highly prospective Sao Joao Project and the adjoining Commandante Araras projects. Samba has set up a loan facility for $500,000 Australian dollars which has been made available to Aurora to complete the study on the Fofoca Gold project (previously named Molly and changed due to confusion with the elemental association). With Samba as the new joint venture partner managing the exploration of the Northern assets, Aurora Gold will focus exploration on the Western extension of Fofoca and follow up the high-grade rock chip samples in the adjoining Bigode property. The Fofoca project was the focus of a 2 stage-drilling program during 2007, and the results of the second stage confirm the depth continuity of the ore zones. Ground based IP and magnetics were conducted over the western extension of Fofoca in late 2007. This work has defined both a magnetic and IP anomaly which has been interpreted as an extension of the Fofoca mineralised structure. Drilling in 2008 is budgeted to test this interpretation which potentially increases the strike length of Fofoca by 200-250 meters. Previous sampling of outcrop and trenches cut at the Cacheira area show some affinity to the Fofoca ores with similar chemical make up. As these 2 areas are linked by the magnetic anomalies, Aurora Gold is anticipating that these areas will link up and form part of a single large area of mineralisation. 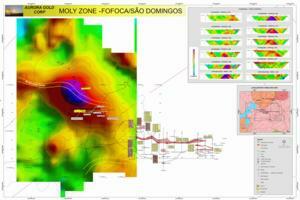 The attached map shows the magnetic trends extending from the Fofoca mineralised area. Aurora Gold is a mineral exploration company focusing on the exploration and development of its 4 exploration properties and 6 applications in the Tapajos Gold Province, State of Pará, Brazil. The project areas were selected due to their proximity to known gold occurrences and from historical records of gold production. Of course as you should note, proximity to an area having historical records of gold production provides no assurance that we will discover any commercial resources on our property. The lithologies associated with the projects are similar to those that have proven to be the host of significant gold occurrences elsewhere in the Tapajos. Aurora Gold's stock trades under the symbol "ARXG" on the NASD OTC Bulletin Board in the United States of America, under the symbols "A4G.FSE" and "A4G.ETR" on the Frankfurt Exchange and "A4G.BER" on the Berlin-Bremen Stock Exchanges in Germany. This press release contains statements that plan for or anticipate the future, called "forward-looking statements." In some cases, you can identify forward-looking statements by terminology such as "may," "will," "should," "could," "expects," "plans," "intends," "anticipates," "believes," "estimates," "predicts," "potential" or "continue" or the negative of those terms and other comparable terminology. Many of these contingencies and uncertainties can affect our actual results and could cause actual results to differ materially from those expressed or implied in any forward-looking statements made by, or on behalf of, us. Forward-looking statements are not guarantees of future performance. All of the forward-looking statements made in this press release are qualified by these cautionary statements. Specific reference is made to our most recent annual report on Form 10KSB and other filings made by us with the United States Securities and Exchange Commission for more detailed discussions of the contingencies and uncertainties enumerated above and the factors underlying the forward-looking statements. These reports and filings may be inspected and copied at the Public Reference Room maintained by the U.S. Securities & Exchange Commission at 100 F Street, N.E., Washington, D.C. 20549. You can obtain information about operation of the Public Reference Room by calling the U.S. Securities & Exchange Commission at 1-800-SEC-0330. The U.S. Securities & Exchange Commission also maintains an Internet site that contains reports, proxy and information statements, and other information regarding issuers that file electronically with the U.S. Securities & Exchange Commission at http://www.sec.gov.